Burnham and Weston Energy CIC has reached its £4 million fundraising target making it one of the UK’s largest community energy crowdfunding campaigns. Burnham and Weston Energy CIC has reached its £4 million fundraising target making it one of the UK’s largest community energy crowdfunding campaigns. Burnham and Weston will now launch its community fund which over the 23-year life of the project is forecast to pay £3 million in surplus profits back into the local community. Initially half of the surplus will be used to support ‘The Sunshine Fund’, a new grant fund for local projects to be managed by the local charitable trust Somerset Community Foundation. The other half will be used help households struggling to pay their energy bills through a fuel poverty advice service managed by the Centre for Sustainable Energy (CSE) working with local partners. 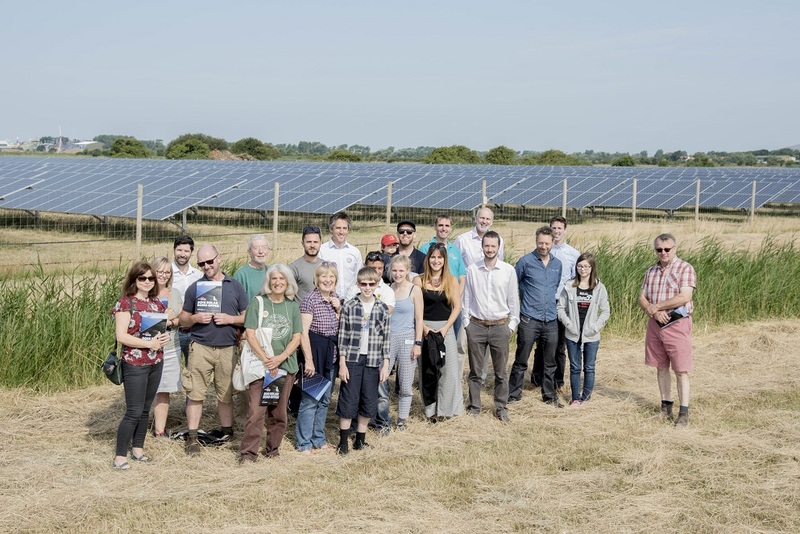 The completed deal means that the company has now fully refinanced the bridging loans which were used to purchase the solar farm in the first place and put the 36,000-panel site into community hands for the next two decades. The bond offer will remain open to new investors as an institutional investor is willing to have its investment scaled back to allow more individuals to invest. The £4 million raised to date means the higher cost short-term funding was repaid as quickly as possible but the offer can still be open to new investors. The solar farm has been in operation for nearly two years and currently generates enough carbon-free electricity to power the equivalent of over 2,000 homes, and over £1 million per year in revenue. The solar farm is built on pasture land leased from a local farming family, who continue to graze sheep amongst the solar panels. Burnham and Weston Energy worked with Triodos Bank, Europe’s leading sustainable bank, to develop the bond offer. Triodos recently became the first registered UK bank to launch an investment crowdfunding platform. The bonds are open to anyone that registers on the Triodos platform and will pay an initial interest rate of 5 per cent a year, which will rise every year with inflation. The initial investment will be repaid in instalments over 18 years. As with all investments, interest payments are not guaranteed, and capital is at risk. The bonds are eligible to be held in a Triodos Innovative Finance ISA which allows investors to earn interest tax-free. The health and local environmental impacts of a fossil fuel-based transport system, and the contribution to climate change. The town’s first street lighting was provided by the local coal gas plant owned by Weston-Super-Mare and District Gas Company. As local energy companies were regionalised, nationalised and then privatised, energy has become a drain on the local economy of towns like Burnham and Weston. Burnham and Weston Energy is going back to a future where energy generation is part of the local economy, only this time it is low carbon and community-owned.